At the center is a jeweled enamel pendant. In 2013 an elderly World War II veteran hands it to his beloved granddaughter and charges her with finding its rightful owner – not an easy assignment, as he appropriated it in 1946 from the Hungarian Gold Train, the repository of millions of items stolen from Jews during the Holocaust. This extraordinary novel leaps and meanders, traveling through time and throughout many countries as the story of the pendant, told in many voices, unscrolls. Filled with history, joy, horror, ethical complexity, poignancy, and – of course – love, this book is itself a treasure. A spellbinding new novel ofcontraband masterpieces, tragic love, and the unexpected legacies of forgotten crimes, Ayelet Waldman's "Love and Treasure" weaves atalearound the fascinating, true history of the Hungarian Gold Train in the Second World War. In 1945 on the outskirts of Salzburg, victorious American soldiers capture a train filled with unspeakable riches: piles offine gold watches; mountains offur coats; crates filled with wedding rings, silver picture frames, family heirlooms, and Shabbatcandlesticks passed down through generations. Jack Wiseman, a tough, smart New York Jew, is the lieutenant charged with guarding this treasure a responsibility that grows more complicated when he meets Ilona, a fierce, beautiful Hungarian who has lost everything in the ravages of the Holocaust. Seventy years later, amid the shadowy world of art dealers who profit off the sins of previous generations, Jack gives a necklace to his granddaughter, Natalie Stein, and charges her with searching for an unknown woman a woman whose portrait and fate come to haunt Natalie, a woman whose secret may help Natalie to understand the guilt her grandfather will take to his grave and to find a way out of the mess she has made of her own life. A story of brilliantly drawn characters asuaveand shadyart historian, a delusive and infatuated Freudian, a family ofsinging circus dwarfs fallen into the clutches of Josef Mengele, and desperate lovers facing choices that will tear them apart "Love and Treasure" is Ayelet Waldman's finest novel to date: a sad, funny, richly detailed work that poses hard questions about the value of precious things in a time when life itself has no value, and about the slenderest of chains that can bind us to the griefs and passions of the past. Ayelet Waldman is the author of the novels "Red Hook Road, Love and Other Impossible Pursuits, " and "Daughter s Keeper, "as well as of the essay collection "Bad Mother: A Chronicle of Maternal Crimes, Minor Calamities, and Occasional Moments of Grace" and the Mommy-Track Mystery series. She lives in Berkeley, California, with her husband and four children." "Waldman is a wonderfully imaginative writer . . . absorbing . . . As with the painting in Susan Vreeland’s Girl in Hyacinth Blue and the manuscript in Geraldine Brooks’s People of the Book the link between these separate stories in Love and Treasure is a pendant decorated with the picture of a peacock. In Waldman’s exceedingly clever treatment, this piece of jewelry is not intrinsically valuable; it accrues value only as it passes from one unlikely hand to another, demonstrating the curious and tragic ways that history binds us together. . . a tense and romantic story that never seems polemical or overdetermined. . . a marvelous panorama of early 20th-century attitudes about women . . . Moving." "What ethics govern the custodians of property that can never be returned? How do the personal and the political intertwine in the wake of historical tragedy? These questions permeate the novel . . . Charming . . . The failings of the characters imbues them with a fuller and more complex humanity . . . the book’s best moments explore subtle ambiguities. . . the human stories behind the looted objects flicker into life." "A cohesive and engaging narrative . . . lively, compassionate characterizations . . . brimming with passion . . . Waldman reaches thoughtfully into an epic sweep of complex issues related to identity, home, dislocation and feminism, and illuminates her ideas through the critical junctures of the journeys of both the pendant and the painting. In the end, as readers, we gain a deeper understanding of what it means to covet and what it means to love." "In Ayelet Waldman's thoughtful, expansive Love and Treasure, American soldiers occupying Austria after World War II discover an immense freight train full of personal effects pillaged from Hungarian Jews . . . Absorbing . . . The pendant's crooked passage across the century serves as a connecting device, holding the book's elegantly balanced parts together like the wire in a Calder mobile. In the end, Love and Treasure is less concerned with belongings than with belonging—with the Jewish people's ongoing hunt for community and homeland, and what one character calls 'a sense of loyalty and identity.' Those things, once stolen, are much harder to get back." "Ambitious . . . The eternal human struggle for self-determination and dignity pulses throughout." "Love and Treasure, the new novel by Ayelet Waldman, couldn’t be more timely. . . Waldman builds her narrative, which moves between three distinct stories and time periods, around one of the most notorious cases of property theft in WWII. . . It is a story ripe for retelling . . . Love and Treasure offers not just one romance, but two—one tragic, one comic. . . Drawing on what was clearly extensive research, Waldman brings to life the world of the Central European Jewish haute bourgeoisie, reveling in its textures, exposing its hypocrisies, and cheering on the incipient feminism that Nina represents. . . [A] fantasia on historical themes." "Classic perfection . . . heartwarming and inspiring. . . interesting and educational, informing the reader about little-known segments of history through the eyes of well-drawn, credible, and sympathetic characters. The narrative progresses in a quiet, steady suspense of human drama without any melodramatic action. One never knows what turning the page will bring. Highly recommended." "Divorced, unemployed, and listless, Natalie Stein goes on a wild-goose chase to find the rightful heir of a WWII relic . . . This screams big-screen adaptation: Natalie Portman as Natalie Stein, perhaps?" 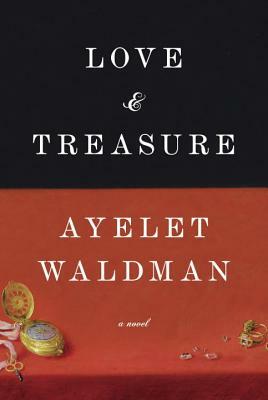 "Nazi gold, a coveted jeweled pendant and a web of intrigue that spans the globe and generations — Ayelet Waldman’s Love and Treasure embodies the staples of a timeless adventure narrative. . . Waldman skillfully crafts her story in three threads before, during and after the war, each awash in the poignancy of loss that grew out of the Holocaust. Love and Treasure invests in deeply complex characters, all searching to uncover a shared history connected by WWII. . . An exhilarating read that is as thoughtful as it is provocative." "When a necklace with a peacock pendant – confiscated along with other treasures from Hungary's Jews – is found in Austria in 1945 by Jack Wiseman, a young Jewish lieutenant in the US Army, he gives it to the Holocaust survivor with whom he has fallen in love. But their love affair does not endure and the pendant eventually comes back to Jack. In 2013, in his final days, Jack asks his granddaughter Natalie to return the piece of jewelry he took so long ago. But how and to whom? Waldman's novel skips continents and generations, telling a multi-layered and well-constructed story." "If the riveting history around which Ayelet Waldman’s new novel is weaved doesn’t draw you in, the characters that infuse it certainly will. Vividly crafted and full of intriguing complexity, Waldam’s characters — a seedy art historian, a clan of entrapped circus dwarfs, a beautiful Hungarian Holocaust survivor, and a vivacious young American army lieutenant among them — breathe life into a story of art, war, stolen treasures, forgotten crimes and star-crossed love, a story that sets off during WWII along the Hungarian Gold Train and spans across decades, cultures, and generations. Skillfully crafted and told from multiple perspectives within a narrative that telescopes through time, Love and Treasure tells a captivating story about treasure lost and found and calls us to reevaluate what it is that we treasure most." "In 1945, an American soldier falls in love with a Holocaust survivor he meets on a train in Austria. She decides to forsake him to build a life in Palestine. He is left only with a necklace. On his deathbed in 2013, he charges his daughter, Natalie, with returning it to its owner. What follows is a complicated and involving story of the lives behind possessions stolen by the Nazis." "Inspired by the true story of World War II's 'Hungarian Gold Train,' the tale set in present-day New York centers on a woman uncovering the truth about what her grandfather did as an American soldier in the war. . . [For] fans of The Goldfinch, treasure hunts and the work of Waldman's husband, Michael Chabon." "This lush, multigenerational tale... traces the path of a single pendant.... Inventively told from multiple perspectives, Waldman's latest is a seductive reflection on just how complicated the idea of 'home' is--and why it is worth more than treasure." “One is quickly caught up in Love and Treasure with its shifting tones and voices—at times a document, a thriller, a love story, a search—telescoping time backwards and forwards to vividly depict a story found in the preludes and then the after-effects of the Holocaust. Waldman gives us remarkable characters in a time of complex and surprising politics." “Love and Treasure is something of a treasure trove of a novel. Its beautifully integrated parts fit inside one another like the talismanic pendant/ locket at the heart of several love stories. Where the opening chapters evoke the nightmare of Europe in the aftermath of World War II with the hallucinatory vividness of Anselm Kiefer's disturbing canvases, the concluding chapters, set decades before, in a more seemingly innocent time in the early 20th century, are a bittersweet evocation, in miniature, of thwarted personal destinies that yet yield to something like cultural triumph. Ayelet Waldman is not afraid to create characters for whom we feel an urgency of emotion, and she does not resolve what is unresolvable in this ambitious, absorbing and poignantly moving work of fiction." "Complex and thoughtful, moving and carefully researched, this is a novel to love and treasure."